You may be carrying a Stock for Long-Term Investing or Short Term Trading. Whatever be your reason, you are in the Market to make a profit. And you can only make a profit if the Stock goes up. Conversely, if the Stock drops, you will have a loss. And you know that, don’t you? To blindly hold a Stock come what may is not a good idea. There better be a valid reason for keeping a Stock. And a good reason for owning that Stock and not another one of many possible Stocks. You could decide to buy a Stock based on #FundamentalTradingSystem or #TechnicalTradingSystem or a combination of both (as in #CUE360Analysis). After you get the Stock in your portfolio, you need to track it regularly. And if the Stock is falling, instead of being rigid in your original assessment, you may take a hard look. Remember, you make money Buying a Stock only if it goes up. If it is falling, at some point, you need to exit, preferably taking a small loss rather than enduring a massive equity drop. Hoping that a Stock will eventually recover is not the smartest way to invest in the competitive Market. Clear Breakouts downward is a warning sign that you may not ignore. And today, Tuesday, 24th April many Stocks in the USA Market broke down below well-established support; the CUE Memory Smart-Auto Trendlines on both Weekly and Daily charts. Here is one example. PWR Broke below Memory Support Trendlines; found using CUE Sonar Program. The Stock is PWR in Construction & Engineering Industry. 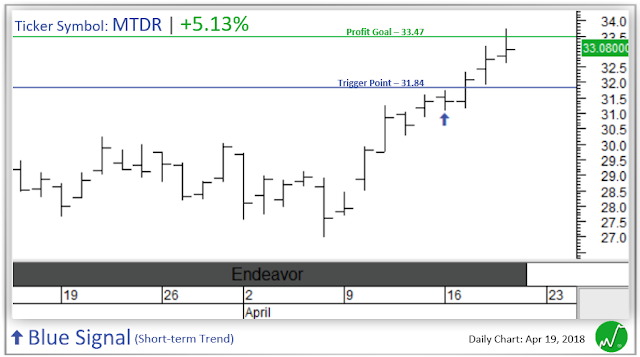 You could find the breakout using Sonar program in CUE Globalfor Metastock or CUE Elite for Tradestation®. It broke down. And you could find that out in real-time exactly when it happened using Sonar scan or dashboard; not after the fact. What about PWR’s Industry? If you are keeping an eye on CUE Industry Rotation Scorecard or are using CUE Edge to get an early heads-up in real-time, you can easily see that the Construction & Engineering Industry Decelerated today. All you need is to read the visual heat-map. That is another sign of possible trouble for PWR. The Stock broke down on the technical chart. Industry Decelerated. What about Fundamentals? Currently, regarding Valuation, it is Optimally Valued. You can see that from color coded Scores in CUE Stock Scorecard. However, there are warning signs in slowing Earnings Growth; it slowed down in the last quarter. Next quarterly earnings result is due on 2nd May. These complete 360° Analysis shows you precisely what is going on in any Stock you are holding. And if that Stock is PWR, there seems to be ample reason to be concerned. Are you carrying similar Stocks? It is then most probably the time to run a 360° Analysis to figure out the health of those holdings; before it is too late. And take action to protect your hard-earned capital. 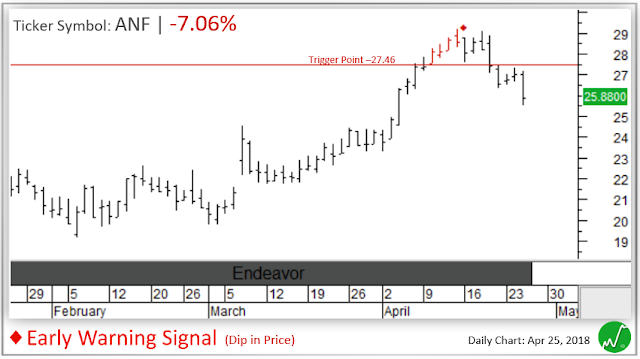 On 4/17, there was an Early Warning Signal on ANF. It said if price crosses $27.46, expect a 2-5% dip in price. ANF crossed $27.46 (red line) just as predicted and ended up dipping a total of -7.06% in 4 days. The Early Warning Signal is a powerful tool that helps traders predict when a dip in price is coming. Curious to know which stocks are going to dip next? No problem! Click the link below and sign up to receive the latest Early Warning Signals right in your inbox. Check out these two stocks that made big percentages in a short amount of time. MTDR had a Blue signal on Apr 16th. 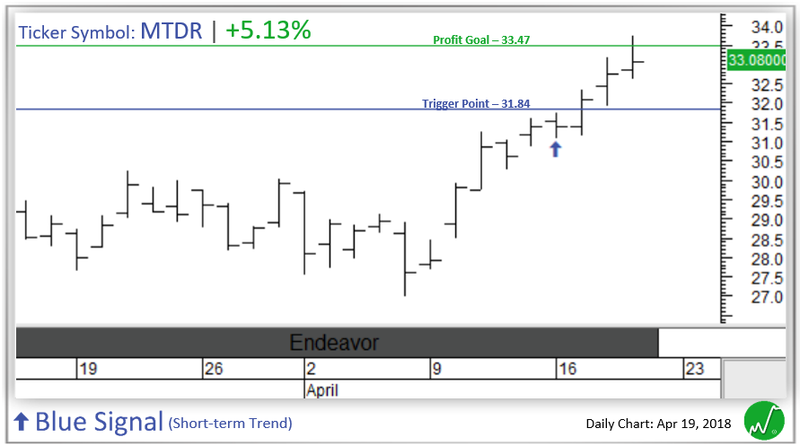 Once price crossed our Trigger Point (blue Iine) it moved up +5.13% in 3 days! FLS had a Blue signal on Apr 10th. Once price crossed our Trigger Point (blue Iine) it moved up +4.92% in 7 days! Want more info on the Blue Signal? No problem! Click the link below. Ever wonder how some people always seem to pick the right stocks? Well, they’re not doing it by themselves. They have help and that’s where we come in! Our Blue Signal can identify short-term trends in your favorite stocks, ETF’s and REIT’s. Take a look at the 3 stocks that made big percentages. LULU had a Blue signal on Mar 28th. Once price crossed our Trigger Point (blue line) it moved up +6.06% in just 13 days! 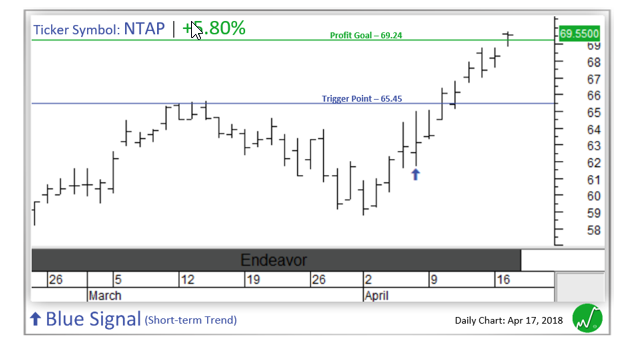 NTAP had a Blue signal on Apr 6th. Once price crossed our Trigger Point (blue line) it moved up +5.80% in just 6 days! MANT had a Blue signal on Apr 4th. Once price crossed our Trigger Point (blue line) it moved up +5.05% in just 9 days! Stocks sometimes move inside resistance areas, and once there is enough buying pressure, it breaks out; often starting a new upswing or maybe even a new uptrend. There are specific breakouts that you can trade for a hefty profit. The successful breakout trades have some common characteristics. They need to provide entry at Low-Risk Buy Point. If the Stock is already up substantially from their resistance breakout, then the Long Entry may carry too much risk. To be successful, a Technical Breakout also has to be accompanied by Heavy Activity showing the presence of aggressive buyers. These are factors that you can quickly and unambiguously identify in a matter of seconds using CUE Technical Trading System running on Metastock (CUE Global) or Tradestation® (CUE Elite). However, a technical breakout is not enough to take the best breakout trades. To choose only the best breakout trades, you need to find a Stock that is Fundamentally Strong and whose Industry is either healthy or is getting strong? How do you identify that easily? Using CUE Edge Industry Rotation, you can find Industry’s strength and weakness in Real-Time. And using CUE Vital Fundamental Analyst or CUE Stock Scorecard, you can instantly carry out a Stock’s Fundamental and Peer Analysis. Together, CUE Edge and CUE Vital or Scorecard gives you the power of a complete Fundamental Trading System. How to identify the best Breakout trades in real life? Let us take a recent example. On 9th April, Merck (MRK), a Pharmaceuticals Stock broke out of the automatically drawn very smart trend line resistance (these are called Memory Resistance lines) with High Activity. Not only that. On the same day, the Stock’s Candle color changed to cyan that is Bullish. The Stock was also breaking out from a well-established base formed by Watermark Support Lines. The breakout started near the beginning of the day. Looking at that, one might take the Long position using CUE Real-Time Fine Tune Chart that uses 5 or minutes interval. That would allow you to enter the trade at an even lower price. This entry technique is standard in CUE Trading and you may learn more on this from the many Weekly Market Roundups including this one. Using CUE Scorecard, you can instantly carry out a Peer Analysis and check if MRK was/is Fundamentally Strong. Here is the result. MRK is not only Optimally Valued, but it is showing some amount of Earnings Growth in the recent quarters. It pays an excellent Dividend Yield %, has robust Earnings Quality. Among its peer Stocks, MRK has one of the best overall Fundamentals. To check the Industry, you could use CUE Edge that shows Industry Rotation in Real Time or CUE Industry Scorecard that provides up to date end of day Industry Rotation Insight. Here, we have neutral characteristics. MRK belongs to Pharmaceuticals Industry. This is part of Health Care Sector. The Industry and Sector are lagging for a long time. And in recent period (say, last 5 days) neither improving or deteriorating. Some long term investors may in fact start to look for Optimal Value Stocks at such times if they are breaking out of base and resistance. MRK fitted that profile. What is the result of taking the MRK Long trade? A long taken on 9th Apr when MRK broke out of Memory Resistance gave substantial profit. One of the traders we know took a Bullish position using Monthly Options Put Vertical (Sell MRK 57.5 Put and Buy MRK 55 Put; both with same expiry of 18th May; which ws just beyond the next earnings date of 1st May). That trade is Opened for a credit of 1.02 USD. As of today 17th Apr, the Vetical is trading at 0.40 USD. That is a substantial profit in six trading days. The same trade could be taken using Long Stock position. What to do now with the profitable MRK trade? MRK continues to be Bullish on both Weekly and Daily CUE Charts. Next Memory Resistance is at around 61.5. One may book at least partial profit then. And one may also put trailing Stop using Stock price as the Stop trigger. 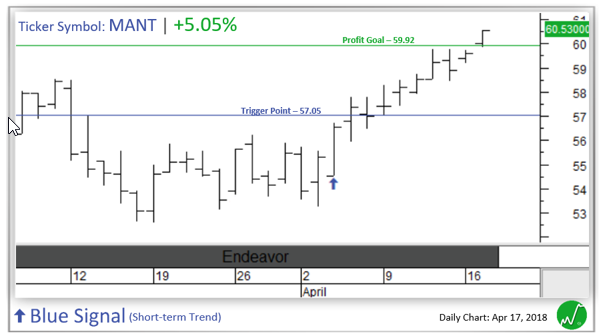 Protection Signal in CUE Technical Trading System immediately shows the current Stop Level for the Long position. The Stop Level is at 57.3 USD; well above the Entry price and therefore practically, this a guaranteed profitable trade from now onward. Want a similar Breakout Trade on Today’s Date of 17th April? That is not difficult. Using CUE Systems you could immediately identify such trades. Disney (DIS) for example. Here is the Technical Trading System chart showing the breakout. It is a Real-Time Daily chart; the day is not over yet. One may look out for high Activity. Combining Technicals, FUndamentals and Industry Rotation analysis, you may find this to be an attractive Stock to Buy. Using CUE Fundamental Trading System (Edge, Vital or Scorecards) you could check out Disney’s Fundamental and Industry strength and decide to Buy or Stand Aside. We would not suggest Shorting Disney at this point. Would you? Like this Breakout examples, you can find many other Breakout Trade Setup as well as Trend Following, Trend Reversion, Exhausting and Sideways Market Setups using CUE Technical Trading System. You may learn more from our Education Center; open to the public and serious traders like yourself. 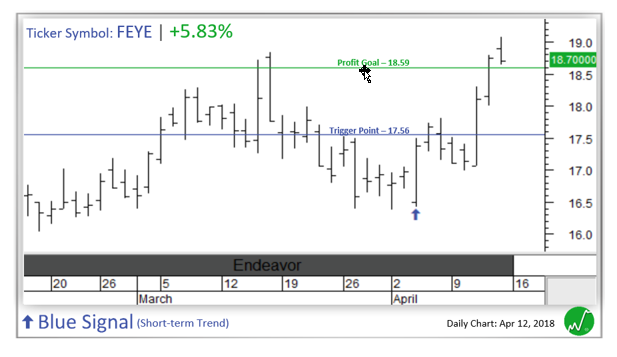 Check out FEYE which had a Blue signal on Apr 4th. 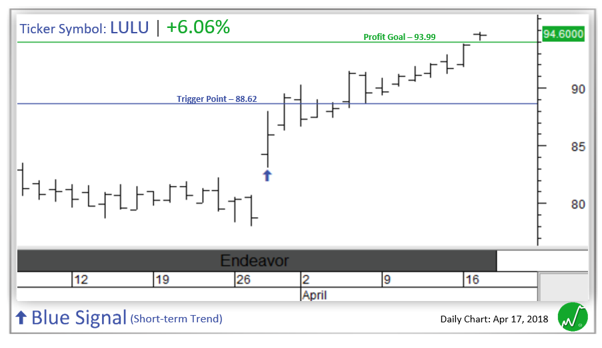 Once price crossed our Trigger Point (blue Iine) it moved up +5.83% in just 6 days! Dr. Elder is the author of the world’s best-selling books on trading, including Trading for a Living. In the past, you could only find such classes in selected cities in the US and worldwide. Now you can learn right from your own home. Dr. Elder will be presenting the key ideas from his latest book "The New Trading for a Living" on planning trades, risk control, and learning from your own trades. Dr Elder will review of the current markets conditions looking at the major indices. Are stocks finally in the value zone? Is the market still too depressed? Dr Elder will give his personal insight and we'll even look at stocks requested by webinar participants. To get the offer described in this presentation, visit https://www.metastock.com/dreldera You can save $100 on the Enhanced Trading Room for MetaStock, PLUS, get a trial of MetaStock if you don't already have it. In the recent weeks, the USA Market had displayed down-up-down or flip-flop movement. We discussed this in depth in the Live Market Roundup of Saturday 7th March 2018. In such a Market situation, it is crucial to adopt an approach that identifies the best Stocks before Buying. What is a best Stock? It is a Stock that has everything going for it. Step by step Top Down Analysis where at every level we try to identify strength, and Buy the Stock only if there is strength in every level or most of the levels; provides such a careful approach. Here is how I carried out the Top-Down Analysis today, Monday 9th April 2018 in Real-Time usign CUE Systems. Sector Analysis: Scorecard and Heat-Map in Real-Time. At the Sector Level, using CUE Edge, I noticed that Health Care as a Sector is lagging behind others. In the CUE Edge Sector Scorecard and Heatmap table, magenta color and a lower score indicate that a Sector is lagging. From the heat-map, it is immediately evident that Health Care is one of the weakest Sectors across all the review periods between 1 Day period to 12 months period. A Sector is too broad for identifying Industry Rotation. Sector move study may not allow us to catch the Fundamentally Strong Stocks just as they resume their up move. For that, we need to drill down to Industry level. CUE Edge allows to drill down from Sector to underlying Industries using a single click. I did precisely that. Here is the resulting CUE Edge Industry Scorecard and Heat-Map for Health Care Industries. Industry Analysis: Scorecard and Heat-Map in Real-Time. What do we see here? In general, the Industries are all weak; we know that from the overall magenta color of the cells in this table. However, there is another critical piece of information that allows us to identify hidden undercurrents well ahead of others. That is the Acceleration that shows up on the Pace Columns at the right. Multiple Health Care Industries have the Pace 1 Day Scores in cyan color. These cyan Pace Scores indicate that though the Industries were behind others, they are starting to sprint. Pharmaceuticals is one such Industry. It jumped and gained Score from 14 over 2 Days to 166 over 1 Day, i.e., today. That is a big jump. And the Pace 1 Day column flashed that Acceleration using the cyan Heat Map color. If Pharmaceuticals Industry is Accelerating, it is logical to drill down into its Stocks and see if we find a Fundamentally Strong Stock. We can do that using CUE Edge with the click of the mouse. Here is the Vital Statistics of Pharmaceutical Stocks as found by CUE Edge; all calculations are done in Real-Time using reliable data from Xenith (Thomson Reuters EIKON). Stock Fundamental and Peer Analysis: Vital Statistics and Heat-Map in Real-Time. Immediately the Stock Merck (MRK.N or MRK) comes to the notice. It is Optimally Valued; indicated by cyan color on Relative Valuation column. Quarterly Earnings Growth is gradually going up in recent quarters. 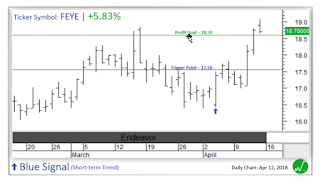 Pays an excellent Dividend Yield of 3.6% and today it went up by about 6% as of the time of this post. So far, MRK looks strong based on Industry Acceleration and Stock Fundamentals. Lastly, we would like to check out the CUE Technical Charts to ensure that there indeed is a Buy opportunity on the chart; that is there is a Low-Risk Buy Point. The series of CUE Technical Charts below confirmed that such an opportunity might be approaching. 1) MRK Weekly Backdrop Chart shows that Candle color changed from magenta (Bearish) to cyan (Bullish) and the Stock reversed from Watermark Support Level (dotted lines near price base). MRK CUE Backdrop Weekly Chart Technical Analysis. 2) In CUE Daily chart, MRK broke out of Memory Resistance (Smart-Auto red color Downtrend Line) after creating a long base at Watermark Level (dotted line below recent price lows). Today’s Activity is high as shown by today’s Activity bar at the bottom. MRK CUE Dialy Chart Technical Analysis. What is the result of these few clicks on CUE Edge and then looking up the charts on CUE Charts? You could find a Stock that is Fundamentally Strong. The Stock is in an Industry that is Accelerating after being down for a long time. And the Stock broke out of resistance today with massive percentage move and with heavy volume. Traders have higher confidence in Buying such a Stock where everything is going for it: Industry strength, Fundamental strength, and Technical strength (moving out of the base and breaking out of resistance), sizable percentage move with high volume. Instead of buying a Stock based on only a Fundamental Trading System or a Technical Trading System. Using CUE Edge and CUE Charts (CUE Global or CUE Elite) you can find such lucrative potential Buy opportunities every day. In real-time. And if you want to Short Stocks or take Bearish trades using Options etc., you can carry out the exact opposite analysis. Start with a weak Industry. Drill down to find Fundamentally Weak Stocks and then looks for Low-Risk Short Point. Either way, you have the confidence that you have done your homework before placing your next trade and that you have a real edge over many other traders using this Complete Top-Down Analysis.